When I was eighteen and looking for a new middle name - a family surname - I nearly chose Taylor, after the other Laura in the family. I eventually chose Hicks, to honor my grandmother, because I did not know enough about Laura Taylor to make the gesture meaningful. All I knew was that she was a cousin who had moved to Louisiana, and that she used to come up to New York on the bus to visit the Hickses, in the 1920s. But the immediacy of a photograph brings a long-gone relative alive in a way that few other records can. And that is why I have brought these two little pictures together, to link the old Southern lady on a bus 90-odd years ago, to her cousin Alida (Reed) Hicks in Ozone Park, Queens. So here are the two little girls, circa 1864, just after the end of the Civil War. The toddler girl hanging on to the column (so as not to fall off the chair) is my great grandmother, Alida Agnes (Reed) Hicks (1861-1926). The baby girl in the splendid little armchair is Laura Evelyn (Taylor) Jones (1863-1928). The photographs were taken in West Chester, the seat of Chester County, Pennsylvania (25 miles west of Philadelphia), where both girls were born. Alida is about 3 or 4 years old, and Laura about a year old (give or take a few months). 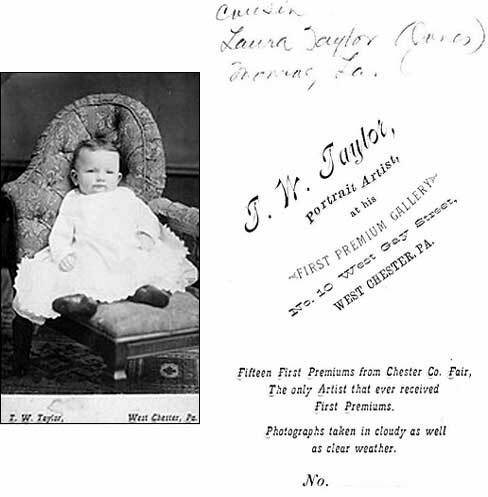 The photographer was Laura's uncle, Thomas W. Taylor, of West Chester. Laura was the daughter of William A. Taylor and Maria Louisa Williams; Maria was Sarah Elizabeth (Williams) Reed's older sister, which made Laura and Alida first cousins. The back of Laura's photo reads: "T.W. Taylor, Portrait Artist at His First Premium Gallery, No. 10 West Gay Street, West Chester, Pa./ Fifteen First Premiums from Chester Co. Fair, The only artist that ever received First Premiums. Photographs taken in cloudy as well as clear weather." It is marked No. 28838 at the bottom; at the top, Alida has written "cousin Laura Taylor (Jones) Monroe, La." I assume that Laura's carte de visite was taken when she was between perhaps 8 and 18 months old. She was born August 6, 1863, so this would suggest a date between March 1864 and February 1865. 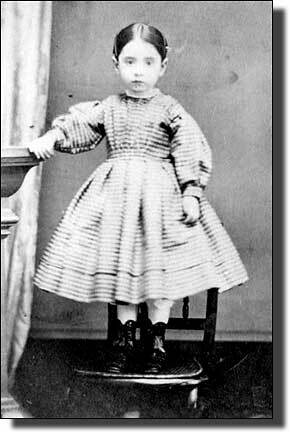 Alida was born on October 16, 1861; she appears to be three or four years old, dating her carte de visite to 1864 or 1865. Thomas W. Taylor was in the Union Army between August 12, 1862 and May 16, 1863. He probably had been working before the war, in order to have won all those "First Premium" awards at the Chester County Fair by the 1864-5 period. Thomas is not in West Chester in the 1860 census (indeed I have not been able to find him conclusively in 1860 at all). He probably began to work as a photographer about 1861 (he is not listed in Craig's Daguerreian Registry which covers the period 1839-1860). The Chester County Historical Society has compiled a list of photographers active in the county in the 19th century; Thomas W. Taylor is listed in this as being active from 1864-1904 (the year of his death). The lives of the two little girls were to take them in opposite directions, soon after the photographs were made. Alida left West Chester about 1867, moving with her family to Jersey City, New Jersey. By 1873 the Reeds were in Brooklyn, where they would remain. Alida married Brooklyn native Charles Garrett Hicks in 1881, and had six children between 1882 and 1891. Laura Taylor, her parents, brother and sister, moved to Camden, New Jersey sometime between 1870 and 1880. Laura was a teacher at the Liberty School in Camden by about 1888 and taught there until her marriage. Laura married Dr. Walter Lee Jones in 1891. He was a dentist, born in 1863 in Brandon, Mississippi to dentist Benjamin Jones and his wife Colen Elizabeth (McCaskill) Jones. I have no idea how they met; perhaps Walter was visiting friends in Camden, as he is not listed in any of the late 1880s or early 1890s Camden directories. Laura and Walter Jones were living in Monroe, Louisiana by the 1900 census and it was in Monroe that Laura would spend the rest of her life. Walter Lee and Laura Jones had two children, but sadly they did not survive early childhood. Charles and Alida Hicks lost a child very young, too. Their second daughter Elizabeth Reed Hicks - named for Alida's mother - died when she was only 11 months old, in October 1886. But Alida's five other children lived into adulthood - Harry Hamilton (b 1882), Alida Mabel (b 1884), Charles Garrett Jr (b 1887), my grandmother Grace Agnes (b 1889) and Lacey Reed (b 1891). From Laura's 1923 passport application I know that she was as tiny as Alida was - just a shade over 5 feet tall, with dark hair and brown eyes. In the passport photo she looks very much like Alida Hicks and my grandmother. I also learned that Laura was vain about her age. Every official record after the 1880 census gives her birth date as August 1868. Another cousin, Bertha (Taylor) Miller - Thomas W.'s daughter -provided an affidavit on Laura's passport application swearing that Laura was born in August 6, 1872, two years after the census which listed her as being 6 years old! I wish that I knew more about the two cousins who remained such dear friends all their lives. It was a long bus journey to New York for Laura Jones. But that journey was short compared to the trip in time the two little girls had taken since Uncle Thomas photographed them in the First Premium Studio in West Chester, Pennsylvania. Rinhart, Floyd and Marion. American Daguerreian Art (New York: Clarkson N. Potter/Crown, 1967). Rinhart, Floyd, Marion Rinhart, and Robert W. Wagner. The American Tintype. (Columbus, Ohio: Ohio State University Press, 1999). 1870 U.S. census, Chester County, Pennsylvania, population schedule, West Brandywine, p. 15, dwelling 112, family 116, William A. Taylor [head], NARA Roll M593_1325. 1870 census, Chester County, Pennsylvania, population schedule, West Chester, p. 41, dwelling 581, family 592, Thomas W. Taylor [head], NARA Roll M593_1925. 1870 census, Hudson County, New Jersey, population schedule, Jersey City Ward 3, p. 91, dwelling 411, family 748, Thomas Reed [head], NARA Roll M593_866. 1880 census, Camden County, New Jersey, population schedule, Camden, p. 322, dwelling 370, family 382, William A Taylor [head], NARA Roll T9_774, FHL Film # 1254774. 1880 census, Chester County, Pennsylvania, population schedule, West Chester, p. 128, dwellling 130, family 132, Thomas W. Taylor [head], NARA Roll T9_1113, FHL Film # 1255113. 1880 census, Kings County, New York, population schedule, Brooklyn ED 109, p. 96, dwelling 271, family 459, Thomas Reed [head], NARA Roll T9_847, FHL Film # 1254847. 1900 census, Chester County, Pennsylvania, population schedule, West Chester, p. 1A, dwelling 13, family 15, Thomas W. Taylor [head], NARA Roll T623 1394. 1900 census, Ouachita County, Louisiana, population schedule, Monroe Ward 2, p. 14A, dwelling 280, family 280, Walter Lee Jones [head], NARA Roll T623 576. 1900 census, Queens County, New York, population schedule, Queens Ward 4, p. 13B, dwelling 244, family 279, Charles Hicks [head], NARA Roll T623 1149. 1910 census, Ouachita County, Louisiana, population schedule, Monroe Ward 2, p. 27A, dwelling 452, family 677, Walter Lee Jones [head], NARA Roll T624_525. 1910 census, Queens County, New York, population schedule, Queens Ward 4, p. 5B, dwelling 86, family 97, Charles G. Hicks [head], NARA Roll T624_1064. 1920 census, Ouachita County, Louisiana, population schedule, Monroe Ward 2, p. 17B, dwelling 392, family 425, Laura Jones [head], NARA Roll T625_625. 1920 census, Queens County, New York, population schedule, Woodhaven Twp., p. 29A, dwelling 604, family 715, Charles Hicks [head], NARA Roll T625_1235. 1890 census, Chester County, Pennsylvania, veterans schedule, West Chester, p. 3, Thomas W. Taylor, Roll 81, ED 55. Special Schedules of the Eleventh Census (1890) Enumerating Union Veterans and Widows of Union Veterans of the Civil War. Washington, D.C.: National Archives and Records Administration, 1890, M123. Ancestry.com. U.S. Passport Applications, 1795-1925 [database on-line]. Provo, UT, USA: The Generations Network, Inc., 2007. Passport Applications, January 2, 1906-March 31, 1925; (National Archives Microfilm Publication M1490, 2740 rolls); General Records of the Department of State, Record Group 59; National Archives, Washington, D.C. Laura E. Jones passport application, June 16, 1923. Ancestry.com. Louisiana Statewide Death Index, 1900-1949 [database on-line]. Provo, UT, USA: The Generations Network, Inc., 2002. Original data: State of Louisiana, Secretary of State, Division of Archives, Records Management, and History. Vital Records Indices. Baton Rouge, LA, USA. Ancestry.com. Camden, New Jersey Directories, 1887-91 [database on-line]. Provo, UT, USA: The Generations Network, Inc., 2000. Original data: Camden City Directory, 1887-1888. Camden, NJ: C. E. Howe Co., 1888; Camden City Directory, 1888-1889. Camden, NJ: C. E. Howe Co., 1889; Camden City Directory, 1890-1891. Camden, NJ: C. E. Howe Co., 1891. Chester County Historical Society, List of Chester County Photographers, link to a pdf document here. Laura and Maven, Thanks for such an interesting Friday session from the collectors. Laura has presented a beautiful set of photographs and a wonderful history of the family and of the photographic type. 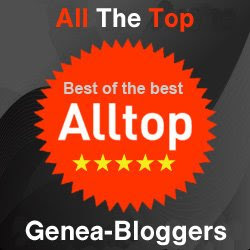 Thanks Laura for writing such an interesting article (and I've noted the Mississippi connection) and thanks Maven for sponsoring this series. I'm learning so much.